Objects do not often speak for themselves. It takes the right artist or poet to find the voice the object demands. I wish I still possessed a copy of my one published academic paper. I remember its subject but not its point. The late Thomas M. Greene was rumored to have liked it; he may have told someone who told another who eventually (a year later) mentioned to me that he considered my work “unique.” (In academia, “unique” is not always not a back-handed compliment, and if he had been my professor he might have asked me to make it a bit less unique.) Professor Greene was an invited guest to a symposium my graduate studies department was holding; I was one of about ten speakers. My work, unique or not, was not invited to Yale, which Professor Greene called home. I was working on George Herbert and Arcimboldo, who had little to do with one another but were both looking for that moment when a work of art transcends work or art. One word, a single syllable, too many or one word mislaid or deleted, and there is no altar there. It is an altar made of words but no less central to the life of a church than an altar made of stone. The poem appears in the only book of poems that he compiled himself, a book titled “The Temple,” which walks the reader, a “dejected poor soul,” through a church. Thus, the altar, “The Altar,” is central. In later eras, poems like this came to be called shape or pattern or emblem poems. They are sometimes used to get elementary school students interested in, captivated by, poetry, the potential playfulness and the playful potentials of poetry. “The Altar” is not one of those poems given to elementary school kids with that playful ambition. It is an altar, however. A “broken altar,” because words are shards of meaning like pieces of stone fitted together to make the church structure. A heart is the only perfect, unbroken, stone for worship, is the only true altar. But all that his heart can make is something out of these pieces of meaning, words, and if he can get out of his own way (“if I chance to hold my peace”), these words as assembled here only exist to worship and love. They are what they are, words, and the words each on their own are not an altar, and a spoken version of this poem is not an altar, either. When is an altar an altar? At what point is a poem something other than, more than, words on a page? Printed on the page (or screen), it is an altar for Herbert’s church in book form. “The Temple” is like a 17th Century pop-up book for Anglican communicants. Just before Herbert was writing his worshipful shape poems, an Italian painter named Guiseppe Arcimboldo was working in Milan. Arcimboldo died the year Herbert was born, 1593, and it is extremely unlikely Herbert ever heard of or saw replicas of Arcimboldo’s paintings. He may have understood them better than many contemporaries—by 1633, the year of Herbert’s death, Arcimboldo was already a forgotten figure in art, out of style, passé. 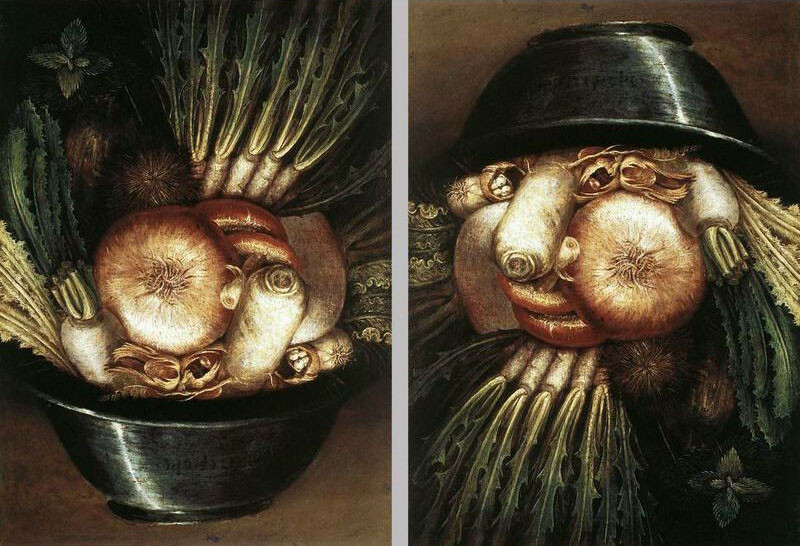 Arcimboldo openly toys with the conceit that what one is looking at is the thing it is depicting. His subject as an artist is the idea that a painting is only a painting and that you the viewer really do most of the work of “believing” that one is looking at something, some thing. This idea is similar to Herbert’s altar of words serving as an idea of an altar and as an altar at the same time. When is a face a face and when is it a bowl of root vegetables? When is a painting a painting and something greater than a collection of chemicals on canvas? The Surrealists rediscovered Arcimboldo for themselves in the 1920s and ’30s, and his paintings have been popular ever since. Herbert never went out of fashion, because he was never a fashion. They are each the most humble of flashy artists, taking themselves out (“hold my peace”) of the way in the name of depicting an idea about ideas. An idea that was revolutionary in the 20th Century, that art did and did not depict anything and was its own thing, had precursors centuries earlier. A gardener is his vegetables, an altar has a worshipful voice; art is self-conscious in its forgetting of self. Your angle on the challenge, as always, fascinating. I love these esoteric side trips of thought (at least esoteric to me, perhaps meat and drink to Others); George Herbert’s poem called to mind the ancient Hebrew altars…they were specifically to be made of unhewn stone; nothing chiseled or wrought by the hand of man. Herbert obviously was drawing on Old Testament analogy. Thanks again for something outside the ordinary box. I hear your words upon the wind. Thank you for your research into some of the most unusual things, and people. You’re a excellent read! Excuse my mistake. You’re simply writing your own answer to the WordPress Daily prompt. For some reason I thought you were the originator of the challenge. I’ve been leaving my answer to the Prompt on your site. So sorry. Thank you for calling me a fool! Last sentence correction : Thank you for NOT calling me a fool!!! I certainly would not call you a fool. I figured you were writing your thought-out and heart-felt responses not only to my attempts at essays but on other writers’ essays, too. Your writing and engaged responses should be getting more attention than from only my eyes. I still have my college paper on the metaphysical poets that I’m willing to surrender to you. Would that help? I love the very last sentence.